Northern province chief minister Canagasabapathy Viswalingam Wigneswaran is a retired Supreme court judge. 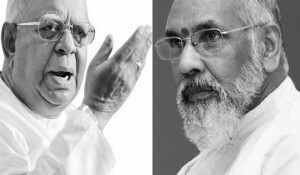 Much was expected of CV Wigneswaran when he was first elected chief minister of the Northern Province on behalf of the Tamil National Alliance(TNA) in September 2013. Sadly those hopes turned into dupes very soon. Wigneswaran adopted a confrontational political approach that left much to be desired. Projecting himself as a Tamil hardliner, the chief minister engaged in all types of disruptive politics while the Northern provincial administration deteriorated. The Northern provincial council (NPC) became the worst -run provincial administration in the country. Today the NPC board of ministers is in a virtual state of paralysis due to Wigneswaran’s obstinate refusal to comply with a court directive. The people of the north who welcomed the advent of the NPC in 2013 are waiting eagerly for its term of office to end in October 2018. The provincial councils of Sri Lanka do enjoy a certain quantum of devolution. They may not have maximum devolution but the powers available are adequate to plan and implement a reasonable amount of development projects. The Provincial council representing the war – afflicted people of the war – ravaged north had an extra responsibility and duty to harness all available resources for the betterment of the province. But this is not what happened. Instead of passing necessary statutes, the NPC busied itself with passing hundreds of useless, irrelevant resolutions. Finances allocated by the Treasury for development work in the province were under-utilised resulting in the remainder being returned to the Treasury.When major projects with international aid for the benefit of the North were initiated by the Government in Colombo, the NPC did not cooperate and instead obstructed them. When concerned Sri Lankan expatriates came up with blueprints to establish employment – oriented, income generating schemes they were rebuffed and rejected. The credo adopted by Wigneswaran and his cohorts was “Abilaashaigalae Mukkiam, Abhiviruthiyalla”(Aspirations are only important not Development).